It is one of the most popular hot beverages in world and especially in India. 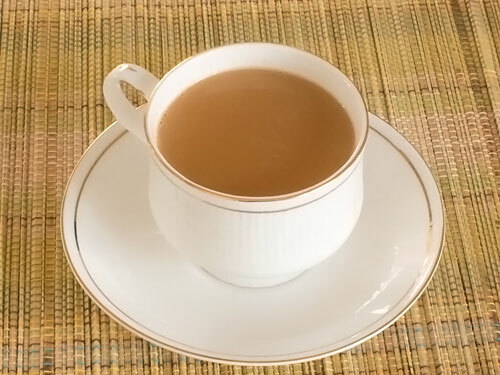 A cup of milk tea (chai) in morning gives refreshing feel and put you on track of long hard day. It can be prepared with milk or milk powder and various types of plain or flavored tea powders. 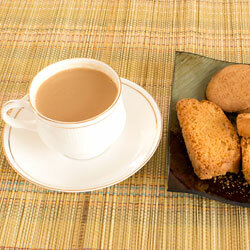 This recipe prepares Indian tea using milk, sugar, tea powder and water. Add sugar and tea powder in it and boil it for 3-4 minutes on medium flame. Add milk and boil it over medium flame for 6-7 minutes or until bubble starts to rise. You will see the change in color of the tea from milky shade to brown shade when it is ready. Turn off the gas and strain tea in cups. If you like more creamy tea, then avoid water and use only milk. Mix milk, sugar and tea powder and boil them over low flame for 6-7 minutes. If you do not like it to creamy, then use more water compared with milk. Add ginger, mint, cinnamon and cardamom or tea masala while preparing it for nice flavorful tea. Serving Ideas: Serve it in the morning with breakfast or in the afternoon with evening snacks. My brother and parents loved it. Today I made tea for the first time. It was really good, it was my first attempt to make tea and I was satisfied with the results. although it says that serving is 2 cups but the ingredients are of one cup (or maybe i messed it up) But I got only one huge cup out of it. So helpful for the beginners.